by Ralph Basui Watkins, Justin G. West. Judson Press, 2014. Two distinct perspectives, one from a seminary professor and one from a youth pastor, offer dialogue on timeless and timely topics facing today’s African American churches as well as congregations from any faith tradition. Ralph Basui Watkins and Justin G. West, both ordained ministers in the African Methodist Episcopal Church, consider issues between older and younger generations, between traditional and contemporary cultural expressions, and between prophetic and praise-based church traditions. 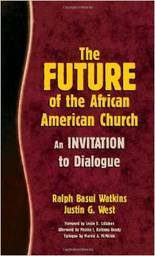 In looking at the present reality and projecting the future state of the Black church, the authors discuss what the African American Church is and what the African American Church can be. Through their conversation, rooted in biblical perspective, they invite respect and reconciliation between groups. As a congregational guide to reflection and action, the book includes questions for small-group dialogue.